¿Está buscando una versión en español? Haga clic aquí. Buying a home is probably the biggest, most expensive purchase you will ever make. Educating yourself before you become a homeowner can help you get the best home for your money. The Make Your Move... A Guide to Homeownership course will help you understand the terms used in the home-buying process, the professionals you'll work with, and the documents you'll need to close your loan. You'll learn what to expect as you go through the process of shopping for and buying a home. You'll learn how to get the best deal, and how to avoid predatory lenders. You will receive a certificate when you finish the course. 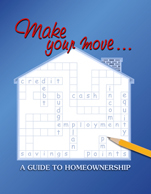 Make Your Move helps you become a financially savvy homeowner. You'll learn why you need to get your finances in shape, and how to do it, before you even start looking at houses. You'll learn how to create a budget, check your credit report and get your financial documents in order. Doing all of this help you be well-prepared to apply for a loan. Realtors? Home inspectors? Underwriters? You'll learn about the professionals that are involved in the home-buying process, and their role in making sure you get into the home that best fits your needs and budget. You'll learn how to find the right lender, and how to questionable or predatory lending schemes. There's more to buying a home that just finding one you like. You'll learn how to select the right home – or build one, if that's the option you prefer. Ultimately, your goal is to find a home you like that fits your budget and your needs. You'll learn about the credit approval process and many of the types of loans available for homebuyers. Some specialized loans may be available to you based on your income, vocation or other criteria. After you get your loan, you'll learn about the steps involved in making an offer and closing on the purchase of your new home. You'll learn how to be a good homeowner. Make Your Move includes lists of seasonal maintenance chores. You'll learn why repairs and maintenance are essential when you're living in your home, and when you want to sell it. I was getting stressed with my home purchase not knowing whose responsibility is what, and I felt left out as soon as I signed the initial paperwork. This class had educated me with the necessary information I need when buying a house, and made sense of most of the things I don't know about loans and laws governing it. This is a wealth of information. Thanks. Great course!!!!! Well worth the money!!!! This was an awesome class, I really learned a lot about buying a house and all that goes with it. I think any first-time home buyer should take the time to purchase this class, it has been very informational. I'm lucky due to fact that my lender and I have known each other for a very long time and I trust him. However, I realize that may not be the same for most people. When I sat down to talk to him about this, I didn't have any knowledge about buying a house. Everything he has explained to me now makes sense! This course is very helpful to me in understanding the home-buying process, and it is organized the way that anybody can easily get it. My special thanks to provider and organizer of this course. Great information for home buyers, both new and seasoned. Thanks for putting this program together. This program taught me the necessary steps to prepare for home ownership and information I didn't know before. I feel like the knowledge I learned will be very helpful for preparing for my future home. Thank you for the info you gave to me. Very informative information. I gained a lot of knowledge to buy a house. Thank you very much. Thank you. This information was pertinent in every way. Very helpful. I hope I will find my home soon. My sincere appreciation to the insights and excellent training provided in this online homeownership research. This was a great class. I really liked that I could listen and follow along. Much faster than reading it myself. With this course, I know have a better understanding on buying a house. Thank you for the opportunity. This program is really helpful and should be required reading for all home purchase transactions. I have purchased and sold seven homes thus far in my life, and I actually still took away several helpful pieces of information for my next purchase. Excited and looking forward to purchasing my first home! This has been so helpful to me. There are so many different things to take into consideration when purchasing a home, and these lessons have given me a broader knowledge about the things to look for, questions to ask and who to talk to. Thank you for make it easier for me. This program has been so helpful to me. I learned new terms and their meanings, thanks to this program I now know the questions to ask and the answer to listened for. Thank you. Great program! Enjoyed it and learned a lot of things. Thanks. This tutorial has been so helpful and has calmed my anxiety about purchasing a home. I realize the stability it will provide for me and my family, and I look forward to the experience. I appreciate the guidance. Very informative course. I learned a lot. This was a lot more informative and helpful than I thought it would be. Definitely worth the time and money. Very good program, even after having purchased a home many years ago! I will use this step by step resource when it comes time for me to purchase a first home. Great insight! Thank you. This was EXTREMELY helpful and resourceful. This program was very informational, and it gave me a better understanding of the home buying process. Great information for a first-time home buyer! This is an excellent program, and I would suggest this to any new home buyer. Great course, full of wisdom and knowledge. It was worth all the hours. I learned a lot of new and important information, thank you. I thank you for this course and the helpful information. Thanks to this, I am NOW ready to be a home owner. I'm glad I took this course. I will definitely recommend it to others. Thank you for increasing my knowledge of the home buying process! Very thorough detailed information that I feel will help me be better prepared to purchase and keep a new home. Thank you. I learned many new things with this course. Some information I already knew as I am in banking. Overall, great information especially for the complete inexperienced individual. Thanks. Program was informative and easy to understand. As former homeowners and college-educated, we were already pretty well informed, but we were surprised how much we learned, especially on topics like financing. (Before this course, we didn't even know what APR was!) Thanks! I enjoyed this information on buying my home. There was a lot of things I didn't realize and options that opened my eyes. Thank you. This program was extremely educational. There were a ton of things I was not aware of. I am thrilled to have learned so much from this. Thank you! A very refreshing update. Many of the things included in purchasing a home change over the years, so it is great to be up to date. Very good definitions for the terms used. I think that all buyers and sellers in the United States should have to take this course before purchasing or selling a home. This was an excellent, interactive and very informative course. Thank you! I would definitely recommend this class to first-time home buyers. I have learned so much and took lots of notes. Great forms to help keep your budget on track, along with great information. Thank you! Excellent program. I feel like I learned more in several hours than I learned in the last 10 years. It really works. Thanks. Lots of questions got answered with this. Opa! Great class. I learned a lot on buying a home and things to keep in mind for the future. This program is very educational. Overall, I do see the material as valuable and crucial information to any potential or existing homeowner. This program was great and opened my eyes to questions I had, and now I can use this as a reference when purchasing a home. It is a very helpful online course. Overall, I learned a lot from this. Thank you. I think this class is very informative, thorough, and easy to understand. This information came to me right before the closing of my first house. However, I'm grateful to say that I didn't make too many mistakes according to this course, so that's a huge relief. The material was very interesting and informative, and I will take it with me for my future home ownership and, if the time comes, for any future sales and purchases I make. Q.) Does the online MYM course have the same information as the book? A.) Yes, the book and the online course have all the same content. The benefit of taking the online course is that you can complete it at times that fit into your schedule. It also comes with audio, for people who prefer listening to information rather than reading it. Q.) When I finish the course, I understand that I'll get a certificate. What do I do with it? A.) Keep it in a safe place, and ask your lender if he or she needs a copy of your home-buyer education certificate. Make Your Move meets HUD and Fannie Mae standards for home-buyer education. Depending on the loan program or product you have, completing an approved home-buyer education course may be a requirement. Your lender may request a copy of your certificate. Q.) I'm downsizing and moving from a house to a condo. I've been through the home-buying process before. Do I need this course? A.) Many changes have occurred since the housing crisis began in 2008, and even though you've bought a home before, you'll want to have current information – and refresh your knowledge about the home-buying process. Make Your Move also contains copies of the Closing Disclosures. Q.) I'm a Realtor. Is this a course I should suggest to my clients? A.) Taking Make Your Move can benefit you and your clients. "The home-buying process can be confusing and overwhelming," said Bill Towey, Realtor/broker, GRI/ABR/CRS. "Buyers who have taken a home-buyer education course are easier to work with, since they have a better understanding of what decisions they will have to make, what is expected of them, and what they can expect from the professionals involved. The detailed information provided in Make Your Move makes it an excellent reference tool for any buyer." You make decisions about money every day – some minor, some that will affect you for years. If you've got questions about repairing or improving your credit and credit score, using a budget, or getting out of debt, you've come to the right place. Financial Education Programs gives you the resources you can need to achieve financial freedom.